Amazon's Fire TV is a great, speedy, oddly expensive piece of hardware, and so naturally Amazon needs to find something that can make it special. Something that can make use of that controller. And what better console-selling exclusive than...Flappy Bird? Yep. 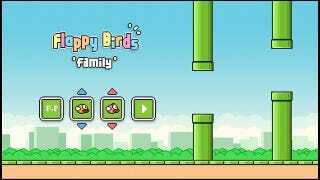 Amazon's Fire TV is the exclusive home of the multiplayer "sequel" to Flappy Bird, Flappy Birds Family. It's pretty much just Flappy Bird again—by the same developer and everything—except with multiplayer. For what it's worth, Our friends at Kotaku are ranked 9th in the world. On the one hand, this is a pretty huge get for Amazon if it has this exclusively for any length of time; Flappy Bird has (absurdly) huge name recognition. At the same time it's hardly something to showcase the gaming power of the Fire TV. Hell, you could probably run Flappy Bird on any old smart TV and control it with your remote. Instead, it shows what Amazon is looking for out of its gaming product. And it's less baby-Xbox, and more iPhone-on-your-TV.